Offering broad spectrum protection, the Recipe For Men SPF 30 Face Cream shields skin from the damaging effects of UV rays and environmental aggressors, such as pollution. Ultra-lightweight and quick-absorbing, the moisturiser defends from immediate and long-term sun exposure to help protect against the sun's rays and premature ageing. The mattifying formula minimises the appearance of visible pores, whilst eliminating unwanted shine for a non-oily finish. Use it every day to protect and hydrate your skin. 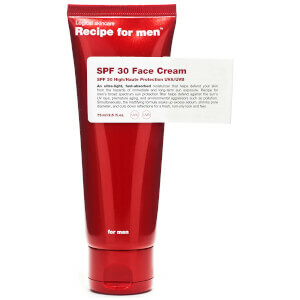 Apply liberally 20-30 minutes before heading outside and reapply regularly. Aqua, Bis-Ethylhexyloxyphenol Methoxyphenyl Triazine, C12-15 Alkyl Benzoate, Dibutyl Adipate, Diethylamino Hydroxybenzoyl Hexyl Benzoate, Ethylhexyl Salicylate, Polymethyl Methacrylate, C15-19 Alkane, Caprylyl Methicone, Ethylhexyl Triazone, Methyl Methacrylate Crosspolymer, Glycerin, Dimethicone, Sucrose Stearate, Jojoba Esters, Potassium Cetyl Phosphate, Sodium Polyacrylate, Butylene Glycol, Dicaprylyl Carbonate, Squalene, Zingiber Officinale Root Extract, Cinnamomum Cassia Bark Extract, Sanguisorba Officinalis Root Extract, Tocopheryl Acetate, Ethylhexylglycerin, Tocopherol, Hydroxyethyl Acrylate/Sodium Acryloyldimethyl Taurate Copolymer, Xanthan Gum, Aminomethyl Propanol, Polyglyceryl-3 Caprate, Glycine Soja Oil, Polysorbate 60, Sorbitan Isostearate, Beta-Sitosterol, Sodium Laureth Sulfate, Phenoxyethanol, Sodium Hydroxide.